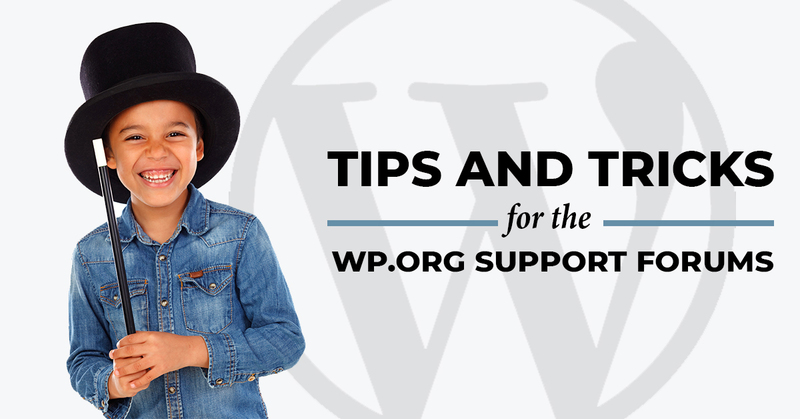 I was honored to speak at WordCamp Los Angeles this weekend, not only to be asked to speak, but also to cover a subject that is near and dear to my heart: The WordPress Support Forums. I’ve had a lot of conversations with developers over the past 5+ years about free support, its merits, its detriments, or just venting frustration about how little respect is given to plugin/theme authors who give their code to the community for free. But the one most common issue discussed in every one of those conversations is this: The WP Support Forums are terrible. With that in mind, one portion of my presentation at #WCLAX was on tricks or workarounds to ensure you’re able to monitor the forums well and have happier plugin users. Here’s the presentation, and below are the tricks spelled out a bit more in detail. The best feature the WP Support Forums offers to monitor your support threads with is email — yes, that’s it, email is as good as it gets currently; which is dreadful. Still, while old school, email can be efficient if you’ve got it worked into your workflow well. If I’m keeping up with my support, then I know that if that “label” is bold, then there’s new activity that I should review. See the BOLD label “FREE SUPPORT”, indicating I have work to do. The .org Support Forums have updated the Subject line of the email notifications to include the name of the repo in them. 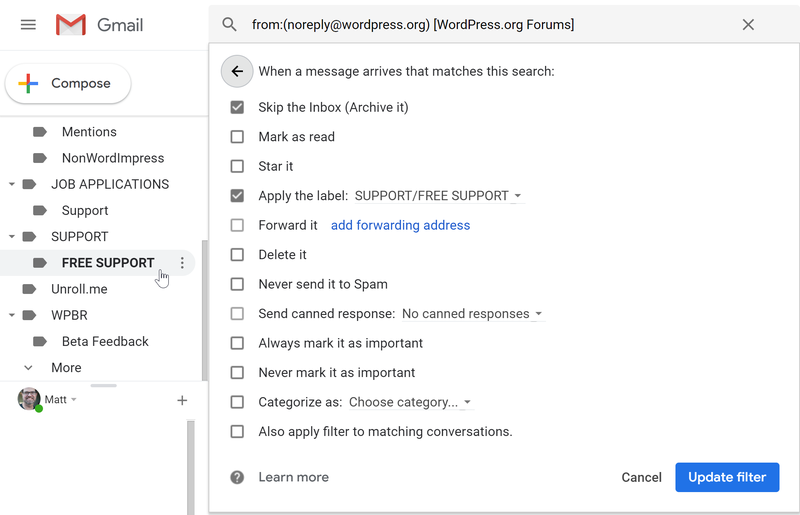 This means you can now add filters in Gmail that target specific plugins/themes. For anyone who supports more than one plugin or theme, this is gold. Here’s my updated screenshot of one filter I just created for my Export Users to CSV plugin. This filter shows how I target the plugin by subject line, and nest the folder within “SUPPORT”. Anytime that foldername is bold I know I have a new notification for that plugin. The downside to the RSS feed is that it only sends new threads, no replies at all. So I use it to send notifications to Slack with their RSS App. What I really enjoy about this is that we have a chance to chat about the ticket in Slack before we reply. You can see the threaded convos above. Additionally, we use Slack reactions to indicate that action was done on each incoming thread. We use the ️ to say that we responded to the user, and the ☑️ to indicate that that thread has been resolved. I stumbled on this hack while chatting in the WordPress Slack Team #forums channel. This is a custom script that runs in your browser via an extension called “Tampermonkey”. Yes, it’s as dangerous as it sounds — but it’s worth it! I have full details on Gist; but the result is that when others on your team also have this setup correctly, you can tell whether they are viewing the same support page as you are. This is really genius in helping prevent team members replying at the same time and potentially have conflicting information (because we don’t always agree all the time, right!?). Every support technician worth their salt wants to insert an annotated screenshot into their replies for clarity. In the WP Support Forums, there’s an image tool, but it essentially requires you to upload your image somewhere publicly available, then paste that URL into the image tool — it’s a major pain. You can see my experimentation post here. This enables you to make the most of your replies on the forums, provide your users with clarity and detail that types sentences simply can’t convey. I’d love to see examples of support techs embedding Soundcloud clips to provide voice-instructions! Sometimes users don’t ask their questions in the forum that you’d expect them to. There are many, many forums on .org and sometimes users just go to the first place they find. So how are you supposed to get notified if someone is asking a question about your plugin outside of your traditional forums? 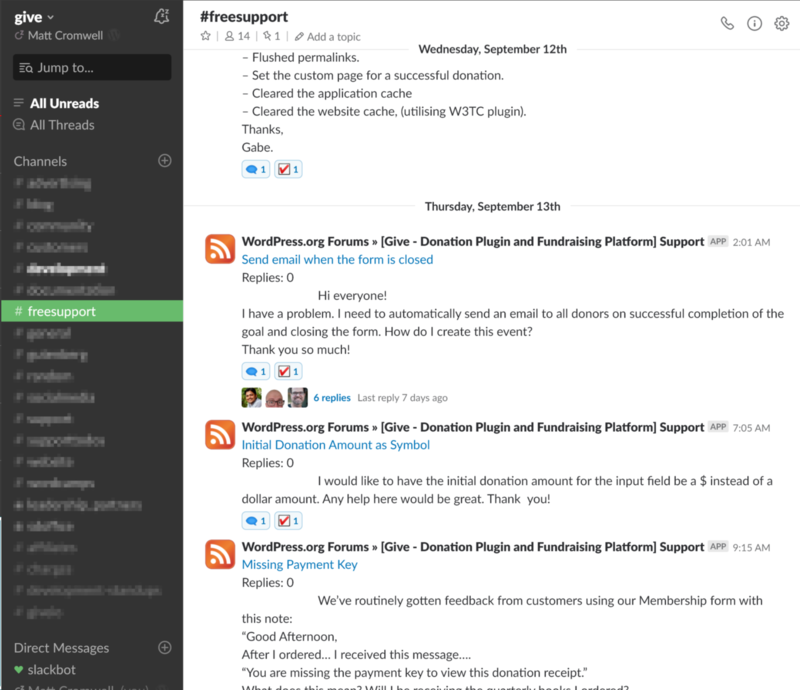 WordPress.org has a custom notifications integration directly with the WordPress.org Slack Team. Essentially, go to your WordPress.org Profile, and click on on “Edit Notification Settings”. 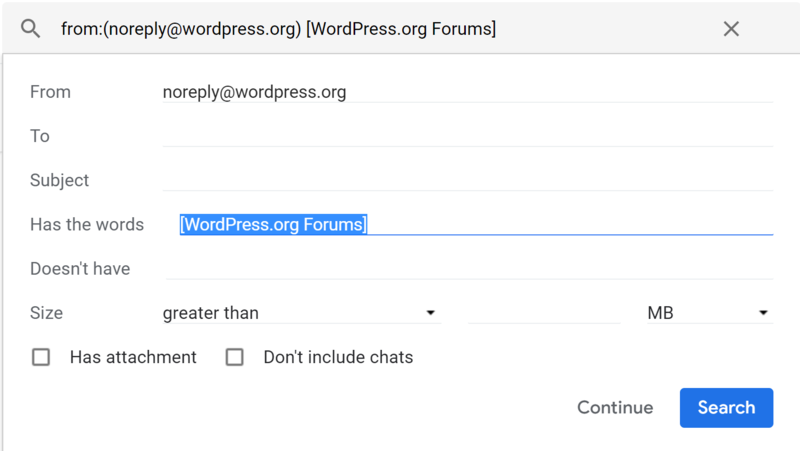 From there, you can set any keyword you like and in the WordPress Slack Team, there’s a bot called wordpressdotorg that will ping you whenever your keyword appears in ANY forum throughout the whole Support Forums. This is a really useful, but potentially DANGEROUS feature. Choose your notification keywords wisely. While I have 6+ years experience on the .org forums, I’m sure my list of tips and tricks is NOT extensive. What are your forums hacks and tricks? What keeps you motivated to work more on the forums? I’d love to hear from you and your experiences in the comments. Hey Matt! My Android native gmail client wouldn’t display some of the content in your mail, and displayed large error messages. Would you like to see screen shots? That’s just how it works, those are rich content, oEmbeds and email just doesn’t support that. But maybe then email readers will click through to the site for the FULL oEmbed experience 🙂 Thanks for reading! thanks for sharing your tips. I have a similar filter set up in Apple’s Mail as well and it works great. I wanted to pick your brain about closing threads. Users don’t always do this on their end or reply if an issue is fixed for them, or when they walked away. When do you consider a ticket to be “resolved” and add that attribute? It depends on the plugin a bit, but generally I aim to get an actual confirmation from the user that the issue is resolved, so I’ll follow-up if I don’t hear from them. If it’s been a week with no reply, I’ll close with a comment. If I get confirmation that all is well, then I follow-up with a request for a 5-star rating #ReviewsMatter that follow-up system for me really encourages user-loyalty to the plugin and increases my ratings a lot as well. It takes work though — all good support takes hard work. Thanks! > .. WordPress Slack #Core channel is VERY interesting ATM. Login and contribute! LOL, contributions and suggestions not matching some obscure secret automattic agenda will get a nice label “Won’t fix” or “Enhancement” or “Plugin / Theme Interoperability” or even “Invalid”, that’s it. 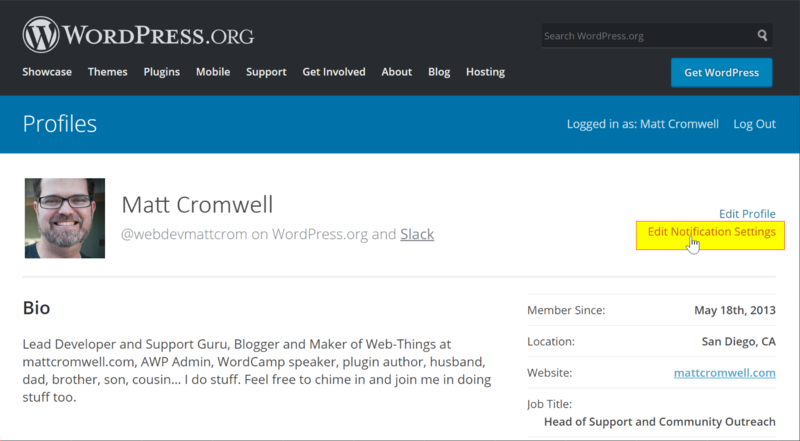 No more motivation to work in any support forums for WordPress at all, that’s it. Thanks for the drive-by comment based on a Tweet I sent that has nothing to do with this article. Did you read the article? Have any questions or comments about that at all? Continue this conversation via emailGet only replies to your comment, the best of the rest, as well as a daily recap of all comments on this post. No more than a few emails daily, which you can reply to/unsubscribe from directly from your inbox.